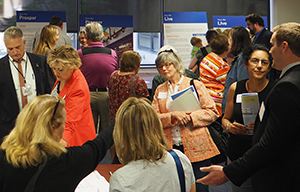 Join us at a public meeting on October 2 to hear details about the full draft of Landscapes3 and provide feedback. The meeting will begin at 5:30 p.m. and be held at the Chester County Intermediate Unit, 455 Boot Road, Downingtown. A dedicated public comment period will follow the meeting opening and a presentation on the plan. This will be a joint public meeting conducted by the Chester County Planning Commission board and the Landscapes3 Steering Committee. Landscapes3 seeks to balance preservation with growth across the county’s landscapes through six goal areas: Preserve, Protect, Appreciate, Live, Prosper, and Connect. To continue to balance growth and preservation, Landscapes3 recommits to core principles that will position the county and its municipalities for success, including resource preservation, revitalized urban and suburban centers, housing diversity, transportation choices, collaboration, and resiliency. View more information about the plan. Registration for the public meeting is not necessary – please join us! The meeting will start at 5:30 p.m.